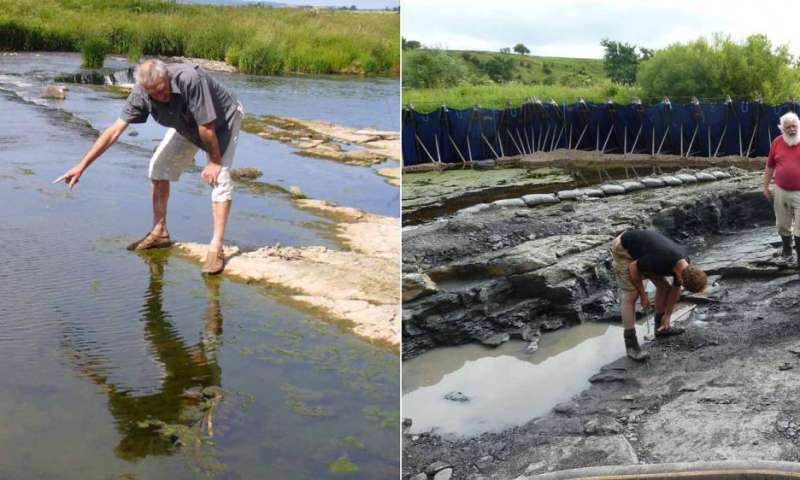 The left hand image shows the late Stan Wood pointing to the place where he found most of the tetrapod fossils from Willlie's Hole near Chirnside, taken in 2010, and the right hand image shows the National Museums Scotland-organised excavation of that site in 2015. Co-authors Walsh and Millward left and centre, with lead author and PI Clack on the right. Credit: Left hand image: Jennifer A. Clack Right hand image: Robert N. G. Clack. (Phys.org)—A team of researchers working at a dig site in Scotland has found tetrapod fossils dated to approximately 15 million years after the Devonian mass extinction—a time period experts in the field have referred to as "the gap," because so few fossils of creatures from that time period have been found. In their paper published in the journal Nature Ecology & Evolution, the team describes the fossils they uncovered and outline their place in the evolution of animal life on our planet. Planet Earth has experienced several mass extinctions, five of which are considered to be the greatest because of the huge loss of plant and animal life. Over the course of one such extinction event, called the Late Devonian mass extinction, approximately 75 percent of all animal species on the planet were believed to have gone extinct. In the years that followed, some of those species that did survive, such as groups of early tetrapods. eventually evolved into what would become the ancestors of amphibians, birds, mammals and reptiles. Unfortunately, the fossil record for creatures of this period is very thin—few specimens have been found, and those that have are fragments rather than complete skeletons. This time period is particularly important in the timeline of evolutionary history because it is when creatures first began climbing out of the sea to move about on land. The fossils found by the research team include two specimens that appear to represent amphibian ancestors while another three are believed to be from bird, mammal and reptile ancestors. Among the finds are other fossil bits that have yet to be identified. All of the fossils came from relatively small creatures—the largest skull was approximately 80 millimeters in length. The team describes the creatures as lizard-like and report that they lived approximately 355 million years ago. They suggest the fossils represent a critical step in the evolution of animal life from a period when creatures were evolving new features that made it possible to live on land—such as limbs and lungs. Prior to this find, researchers have uncovered just two fossil finds from the gap—one from a site in Canada and another in the U.S. In the past, researchers have theorized that there was a dearth of creatures that had bones to leave behind, possibly due to low atmospheric oxygen levels.The new finding strengthens theories suggesting that the lack of fossils from the gap years is due to researchers simply not finding them. The end-Devonian to mid-Mississippian time interval has long been known for its depauperate palaeontological record, especially for tetrapods. This interval encapsulates the time of increasing terrestriality among tetrapods, but only two Tournaisian localities previously produced tetrapod fossils. Here we describe five new Tournaisian tetrapods (Perittodus apsconditus, Koilops herma, Ossirarus kierani, Diploradus austiumensis and Aytonerpeton microps) from two localities in their environmental context. A phylogenetic analysis retrieved three taxa as stem tetrapods, interspersed among Devonian and Carboniferous forms, and two as stem amphibians, suggesting a deep split among crown tetrapods. We also illustrate new tetrapod specimens from these and additional localities in the Scottish Borders region. The new taxa and specimens suggest that tetrapod diversification was well established by the Tournaisian. Sedimentary evidence indicates that the tetrapod fossils are usually associated with sandy siltstones overlying wetland palaeosols. Tetrapods were probably living on vegetated surfaces that were subsequently flooded. We show that atmospheric oxygen levels were stable across the Devonian/Carboniferous boundary, and did not inhibit the evolution of terrestriality. This wealth of tetrapods from Tournaisian localities highlights the potential for discoveries elsewhere.